The start of September means one thing to me: football. Back in the day, friends and I used to play on a flag football team in the park on Saturday mornings. This is hilarious for so many reasons. First, I watch football, I don’t play it yet somehow I was talked into joining the team. Second, I’m fairly certain we were universally hated in the league as we spent the majority of the game laughing and making fun of each other. Third, we were terrible but damn, it was fun and it made for some very long Saturdays. By 10am we were typically comfortably ensconced in the local bar for our post game fiesta. Pitchers of beer flowed freely and platters of chicken wings came out by the dozens. We would routinely go through at least one waitress shift change and more than once, departed to discover it was dark out. Oops. To this day, it’s hard for me to watch a college football game without hankering for some wings. While the bar favorite of those long Saturdays were the standard spicy Buffalo, I went a different direction today. 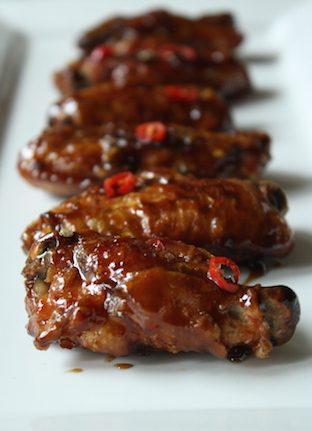 I’ve been craving a sticky, sweet yet spicy chicken wing. 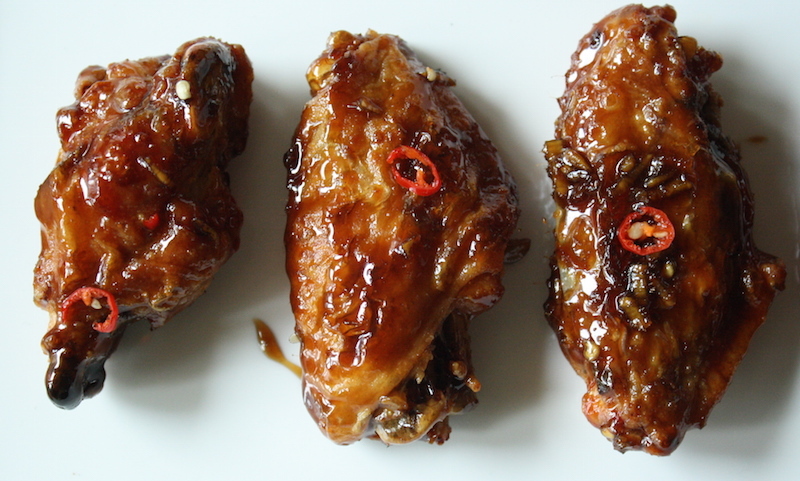 Taking an idea from wings I’ve had in San Franscisco’s Chinatown – yes, I ordered chicken wings in Chinatown and they were amazing – I came up with these. With one exception. I’m not big on frying at home. The mess, the lingering aroma – it all just seems a bit much for a couple dozen wings. So instead, I bake them with some great results. A light coating of salted flour and a high heat develops a crunch that is pretty fantastic. The trick is high heat and a quick spritz of vegetable oil. A little fat is needed if you’re going to even attempt to mimic frying. I’ve seen recipes that have a baking soda coating and are left to air dry in the fridge overnight but honestly, I don’t have that kind of space, patience or the foresight to plan ahead like that and you know what? The oven bake works just fine for me. The sauce is a combination of typical Asian ingredients boiled until thick and syrupy with a good jab of ginger and a slight hit of heat from the chile flakes. Sometimes I’ll double the chile flakes if I’m feeling particularly punchy. The recipe calls for palm sugar, which I particularly like, but if you don’t feel like a trip to the Asian market, try light brown sugar or regular granulated sugar. A quick toss in the sauce when they’re hot and right out of the oven, and you’re ready to go. Be sure to serve with a ton of napkins, maybe even some of those Wet-naps if you have those lying around. These things are deliciously sticky and incredibly messy and I wouldn’t have them any other way. I think I’m going to institute a regular thing – Chicken Wing Friday. Get ready. STRESS THERAPY BAKING FACTOR: FINGER LICKIN’ GOOD. There is something to be said for gnawing on chicken bones and sucking sticky sauce off your fingers. While I call these football food, they are definitely not something you might eat while sitting on the couch. The sauce proves a challenge in these situations as they can be quite messy. Just hunker down around the coffeetable and bring a big pile of napkins or the whole damn roll of paper towels. For the sauce: Combine the water, ginger, palm sugar, soy sauce, salt, rice vinegar, pepper and chile flakes in a small saucepan. Bring to a boil over medium heat then add the corn syrup and honey. Reduce by half – this will take about 35-40 minutes. Spread the wings on the baking sheet in a single layer and spray with vegetable cooking spray. Roast the chicken for 30-35 minutes, turning once or twice, until browned and crispy. 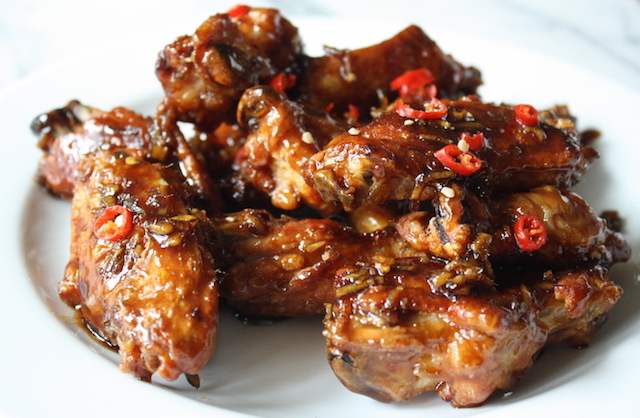 Place the chicken wings in a medium bowl, top with the sauce and toss to coat. Garnish with thinly sliced scallions and/or chile peppers if desired. Serve hot. lovely idea. I use a broiler pan (one of those with the separate top with the slots, and it does a great job of letting the excess chicken fat drip away from the wings. we also do thighs this way, having “hot thighs” often.